If you were to stroll through any home center's power tool section and take a look at the drills, you'd find that almost the entire selection is made up of cordless models. Obviously, cordless drills are very popular. Does that mean that corded power drills are antiquated and you should only consider a cordless model? Absolutely not. There are plenty of times where a corded power drill is the right choice for a task, whether it's on a job site or in the woodshop. While cordless drills are very useful due in part to their portability, there are still tasks that still require more power than a cordless will provide. 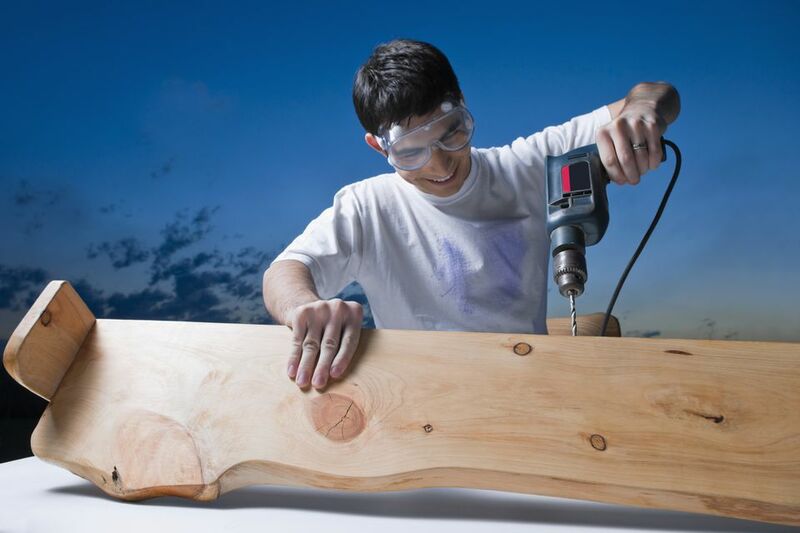 When drilling numerous holes of large diameter, particularly large paddle bits, a corded power drill should be your tool of choice. Performing tasks that require considerable power would tax a cordless drill's battery far more than recommended. When looking for a corded power drill, you'll find that most of the features mimic those found in cordless drills, namely a keyless chuck, reversible action, and comfortable grip. However, while cordless drills have two speeds, power drills are typically variable speed, which can be very useful when you need to slow down the action. Additionally, some power drills incorporate a hammering action that, while not usable for woodworking, is handy for drilling through concrete, bricks or cinder blocks. Corded power drills typically come in two different sizes, 3/8-inch and 1/2-inch. This relates to the size of the chuck and is indicative of the largest diameter bit that the drill will accommodate. In most cases, a 3/8-inch size will suffice, but if you need to drill larger holes regularly or simply want more power, you might consider spending the additional money for a 1/2-inch model. While power drills aren't typically overloaded with safety features found on other power tools, that isn't to say you shouldn't exercise caution when using your power drill. Avoid wearing loose-fitting clothing or jewelry that could get caught up in the drill. Unplug the drill when not in use, and always wear safety glasses. Additionally, be sure to read and follow the safety instructions found in the power drill's owner's manual. Beyond these obvious safety precautions, there are a couple of additional safety suggestions that typically need to be mentioned in any discussion of corded power drills. A power drill should never be carried by the cord. This can cause the cord to dislodge from the casing and cause the power cable to possibly short out. Regularly check your cord for damage. Second, when drilling with paddle bits, be sure to hold onto the drill with a bit firmer of a grip than you normally might, perhaps even holding with two hands. Because of their spade-like shape, paddle bits can occasionally bind against the stock, which will cause a considerable amount of torque back to the drill and, subsequently, into your hand. It doesn't take more than one sprained wrist caused by a binding paddle bit to remind the operator to hold on tightly.